The U.S. microgrid market is expected to grow five-fold from about $8 billion in 2013 to $40 billion in 2020. To me, that indicates an immediate need, as well as a validation that the existing technology is delivering a valuable solution. I have often been asked by clients over the last year if microgrid technology is ready for prime time and if it’s an investment that every large energy consumer should consider. The technology and trends in the energy market are changing rapidly and making the decision about when to invest a valid question. My best advice to clients has been to work with a trusted partner that has substantial microgrid experience and a design philosophy that makes their system scalable and flexible to adapt to changing needs. The good news is that the trends driving microgrid performance are all highly positive. So for all of you out there wondering if the time is right to invest in a microgrid, let me answer some of the most frequently asked questions from our energy management clients in recent months. 1. What does a microgrid do? In layman terms, a microgrid manages distributed energy resources and interconnected energy loads within a defined electrical boundary like a campus or business park. Distributed energy resources can include both traditional fossil fuel generators and renewable energy resources, like solar, working together. This intelligent system operates as a single controllable entity working in parallel with the utility grid or in an optional islanded mode where it disconnects from the grid and operates under its own power. In short, it keeps the electricity flowing to critical loads regardless of available utility services. Think of a microgrid as a conductor working to keep your energy system in harmony. That means carefully balancing supply and demand in both on-grid and islanded modes, as well as safely managing the switch back and forth, all while maintaining power stability and quality to protect your infrastructure and equipment. 2. How will a microgrid benefit my organization? Energy users are quickly realizing the importance of local energy generation, as well as more efficient management of renewable energy resources. Severe storms, power outages, aging energy infrastructure and rising costs have created a period of energy uncertainty. Thankfully, the introduction of microgrids is shifting control of our electricity system to the end user by providing an advanced level of energy flexibility and control, which was only available to large energy producers and distributors until the introduction of this technology. Large and/or critical energy users – from cities and colleges to manufacturing and military operations – have different needs. Some require a resilient energy system to protect their communities during an emergency, while others need to optimize their energy to drive business growth or protect critical operations . . . and all want greener energy sources. Whatever the reasons, customizable microgrid solutions deliver optimal performance to meet a wide range of critical business needs. 3. Who should invest in a microgrid? The client profile for microgrid owners is expanding rapidly, but the following is a good synopsis of the type of organizations that will reap the greatest benefits this year. 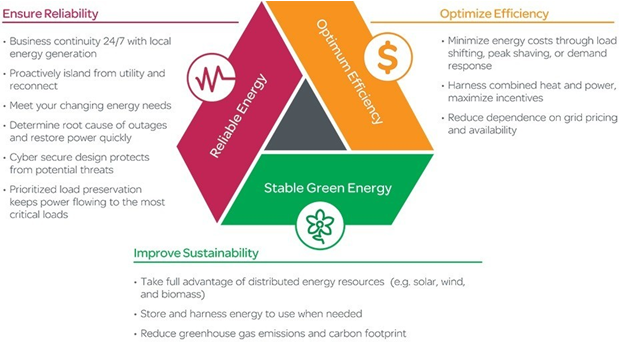 If you can put checks by at least two of the three criteria below, then you should explore microgrids in more detail. Do you have a campus (multiple buildings) that use or need 500kw or more of capacity and desire 24/7 reliability, improved efficiency and sustainability? Do you have or desire to have one or more sources of distributed energy resource at your campus/ facility? Do you have high electricity rates? The lowest rate in the US is ~7 cents/kwh with the highest rate being 34 cents/kwh in Hawaii. 4. Can my organization afford a microgrid? While there is a case to be made for 24/7 energy reliability being priceless in an emergency, I will say that there has never been more financial incentives driving microgrid adoption than right now. Federal and state government agencies are seeing microgrids as a way to address the aging grid infrastructure to ensure high-risk areas have a resilient energy system that can protect citizens during storms or other types of emergencies. The State of New York, for example, just announced $40 million in funding for microgrids. Connecticut, New Jersey, Texas and California all have their own incentive programs in place. In addition, other states have clean energy programs to help encourage energy efficiency and renewable energy sources, many of which can be used to implement distributed energy resources. In the last few years, we’ve had multiple clients that had a large portion of their costs covered by federal or state grants, and others that used energy savings performance contracts to pay for the project over time with their energy savings. The result has been minimal out-of-pocket costs for these projects. My advice here is to work with a microgrid provider that will support you on every aspect of your project, including identifying and securing funding for your project. 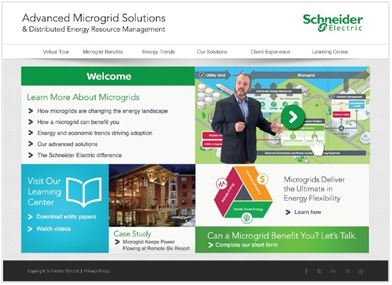 If you are thinking a microgrid and distributed energy resources can benefit your organization, I encourage you to learn more by visiting our new website at www.microgrids.schneider-electric.us. The website covers microgrid technology and trends in much more detail via a virtual tour to explore the building blocks of a microgrid, client case studies as well as white papers & videos. And as always, feel free to ask me any questions about microgrids in the comments section below. Is there an opportunity for a microgrid to be shared by multiple user organizations (e.g., multiple companies that are tenants of the same office park dividing the cost), or does this introduce too much complexity to the commercial structure of the microgrid purchase/user agreement?